Troy Hovenden (The Reptile Bloke) has spent more than fifteen years studying, keeping and handling reptiles and is a fully licensed snake catcher servicing The Blue Mountains and Western Sydney. 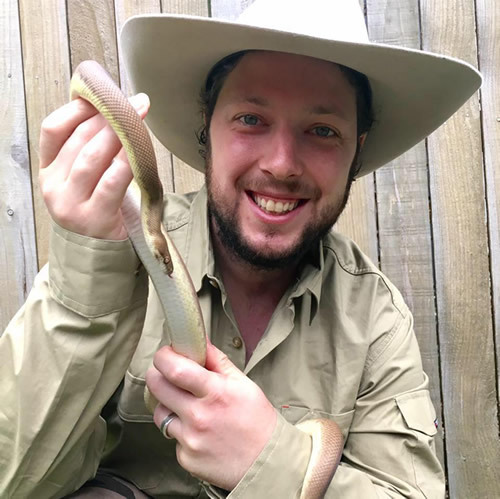 Troy has had an interest in Reptiles (snakes in particular) since he was a child and currently keeps in his personal collection many different species from harmless Children’s Pythons (Antaresia childreni) to the worlds most venomous snake, the Inland Taipan (Oxyuranus microlepidotus). So far so good, to this day Troy has never been bitten by a venomous snake. By calling The Reptile Bloke to remove a snake on your property you can be assured that you are receiving a professional service by someone who truly understands reptile behaviour and is adequately experienced to perform the job safely. In addition to this Troy is able to give sound advice on being snake safe around your home. In Australia we have about 170 species of land and sea snakes. Most of our snakes are brown in colour to some extent and it can be very tricky for the average person to tell them apart. Also, in Australia we have some of the most venomous snakes in the world and it can be difficult for inexperienced people to know the difference between what is venomous and what is not. For this reason, it is always best to contact a licensed snake catcher with the appropriate training, dedication and experience to correctly identify the snake and remove it safely. Feel free to call The Reptile Bloke at any time for advice or relocations.